Most dog owners are well aware of the increased danger of losing a spooked pet. Between thunderstorms and fireworks, summertime brings greater potential for pup paranoia. While it’s important to take every preventative precaution to keep your fur baby safe, accidents happen. According to the ASPCA, roughly 3.9 million dogs are brought to shelters every year. Only about 542,000 of those get reunited with their owners. 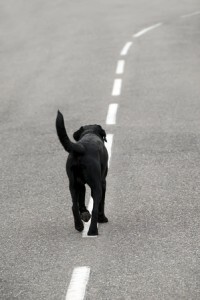 Do you know what to do to help get your dog home? One powerful and effective tool – literally at your fingertips – is social media. Does your town have a Lost and Found Pets Facebook page? Look into it, and join if you haven’t already. If there is no social media group for pets near you, think about starting one yourself. A village of eyes and ears is key to happy endings. 1. Hopefully, your dog is microchipped – make sure your contact info is up to date! You can do it for free at the Found Animals Registry. 2. Put up large, bright signs in the area. Cover all major intersections within a mile or two of your home or where your pet was lost. 3. Bring a lost pet flyer to the shelter. 4. Leave something that smells like you outside your residence or near the place you lost your pet. Dirty laundry (the dirtier the better!) works well. Socks, sweatshirts, your pet’s bed – anything well worn that carries a familiar, comforting scent. Often, pets SMELL their way home. 5. Check your local shelter online and in person every day. Dogs can look drastically different after even just a short time on the streets. If possible, go to the shelter and look around yourself. Here’s hoping you never have to find Fido. But if you do, stay calm and make good use of your network for a safe homecoming.